So, At work the other day I was handed a copy of the showreel I submitted to Grundy Television in 1994 as my application to audition for Neighbours. To be honest I had forgotten all about it. What was I thinking?! Even then I couldn’t resist the temptation to send myself up. The video features a skit from the hit Aussie comedy show Fast Forward entitled “Reach for the Bucket” , scenes from the ABC drama “Embassy” in which I appeared for three seasons, the feature film “Gross Misconduct” with Jimmy Smits, the mini-series’ “All the Rivers Run 2” and “Snowy”, the NBC Telemovie “Mercy Mission” with Scott Bakula and the feature film “Beyond My Reach”. The video also features my beautiful wife Jennifer Hansen in her guise as newsreader for Channel 10 Melbourne. Enjoy a little blast from the past! Robin Hood Sparkles in Dunstable. The Magic Beans Pantomimes production of Robin Hood and the Babes in the Wood opens it’s season on December 12 at the wonderful Grove Theatre in Dunstable. A few days before opening the cast took to the streets of the town on a flat bed truck to spread the Christmas Sparkle message. We travelled all over Dunstable visiting sponsors like Specsavers, Costa, Tesco and Sainsbury’s. The response from the citizens of Dunstable was warm and appreciative with much hilarity when Steve Hewlett’s “dummy” Arthur Lager chatted up the lady folk! A huge highlight for me was meeting a gentleman who had a copy of the programme from my 2002 panto season in St Albans. It was a hugely successful day culminating in a special Christmas Sparkle concert in Grove Park. Here’s some pics of the day. 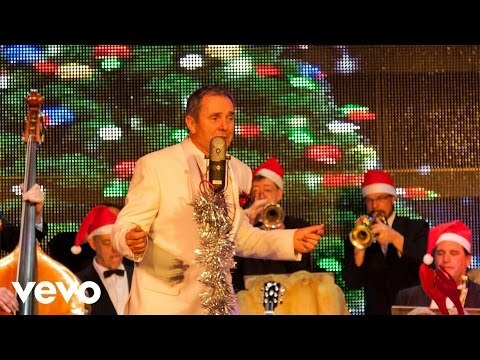 I am really looking forward to another Festive Season in the UK working with great mates on a fun show. If you are anywhere near Bedfordshire I would love to see you at the show. I will be posting regular panto diaries. All the deets on my panto HERE. This year the song remains available on iTunes BUT I am including a CD copy in every personalised Christmas Card I am sending out. My Christmas Package of card and CD for only ￡10:00 (Only ￡8.50 for my subscribers) is proving a big hit. If you are looking for a cute, reasonably priced gift for friends or family look no further! The last four weeks have been a wonderful creatively. The crowning event has been the 20th Anniversary episode of the Kennedy family arrival on Ramsay Street. The episode ran on Australian TV on October 3rd and on UK TV on October 17. I hope you managed to catch it. If not it is worth a look if only for all the fun and saucy flashbacks covering 20 years of the family’s involvement with the fabulous Neighbours. My time on the show has been the highlight of my career and every day I count my blessings for the opportunities and professional satisfaction the programme has brought me. I have created a Dr Karl Kennedy page on this website to celebrate our 20 years with lots of fun photos and interesting links. Musically things have been as fun as they have been varied. I joined with the Pacific Belles and the U.F.O. (Ukelele Family Orchestra) to record a version of the old Bing Crosby/ Andrews Sisters classic “Ac-Cent-Tchu-Ate the Positive.” This project was to support fundraising for Creativity Australia’s support of community singing. Lastly I stepped into the Fox FM Studios in Melbourne to record a cover version of Taylor Swift’s “Shake it Off” for the Fifi and Dave Breakfast show. Here’s how that came out. I hope you are enjoying Neighbours and my website news. Coming up…. I’m am off to gig in Iceland!